The last services on the M5 (located just before the road splits into two routes across Devon), Exeter sits in an industrial estate and is connected to the local cycle network. It is an important part of the 'staycation' experience - mainly because whenever the holiday season comes around, this place turns manically busy. First two hours free for all vehicles, after which cars must pay £15 and HGVs, caravans and motorhomes £26.50. HGVs can pay £28 to include a £10 food voucher. Prices are paid using PayByPhone - more details. The location code is 2436. The refurbished main restaurant in 2019. Firstly, Exeter is the most southern motorway service station in the UK. The service area is very short on space. The amenity building and car park both have a huge increase in custom during the summer holidays. There is a particularly high demand for advertisements here, usually showcasing various Devon attractions. There is still a grass bank which can be used for walking dogs. During 2017, Moto began to redevelop the interior here. 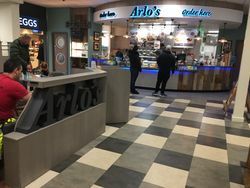 As part of this, the EDC was removed and replaced by Chow and Arlo's, with Costa getting a refurbishment and a West Cornwall Pasty Company external kiosk being installed. The toilets area was also refurbished, along with the addition of a Changing Places. 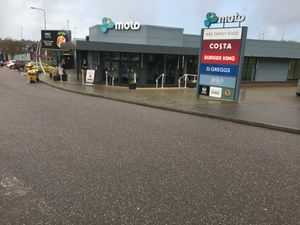 Then in 2018, the entrance was moved to a new extension, built on top of the old Costa outdoor seating area. This also allowed the West Cornwall Pasty Company store to be brought inside and now has its own internal unit.